About 2380 years back a valiant king of our beloved motherland was on a happy hunting spree close to the summit of Mihintale rock. "Tissa Tissa" said a voice. King Devanampiya Tissa was puzzled. May be he was angry at being called by his given name. 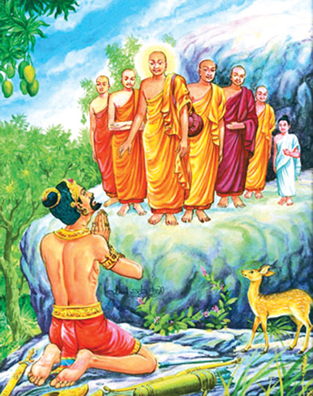 Those hallowed words were to be the auspicious spring of a new era, which would engulf Lanka with the Teachings of one of the noblest and Enlightened who walked this earth. A gracious and repentant king abandons his deer killing pastime, throws his bow and arrow and becomes the first Lankan to embrace the teachings of Gauthama Buddha, made known to him by Mahinda, the son of one of the noblest kings who had ruled on this earth. King Asoka was an invincible monarch and conqueror, who practically took over most parts of Bharath and Mongolia. This was about 200 years after the Buddha attained Nirvana. After the famous battle of Kalinga, King Asoka upon seeing the massacred human beings, threw his weapons of death down and sought the words of the Enlightened one. H.G. Wells, in his epic 'Outlines of world history' calls him the greatest monarch of the world who walked this earth preaching and living through example the Teachings of his Master. He led others into the beautiful path of tolerance. His immortal edicts have been enshrined in the Ashok Chakra in the hallowed Indian National flag. It was this sagacious King who sent his beloved son Mahinda on that memorable Poson Full Moon day to our land. History was made that day. This everlasting happening took place 236 years after the passing away of the Buddha and about 300 years before another revered Teacher preached his words on Love, forgiveness, humility and the wages of greed and peace. He was Jesus Christ. May I as a follower of Jesus Christ, in a little gem of an island where more than 70% are Buddhists, share my thoughts as a Christian, on this lovely day on the impact the words of Gauthama Buddha have had in our country. The Buddha walked on this earth for eighty years and preached for about forty years. He visited our blessed land three times. He left his footprint on the summit of a mountain. Thousands of simple devout followers of Gauthama Buddha visit this hollowed shrine between the full moon Poyas of Duruthu and Vesak. I was privileged to trek up to the summit, pay my respects to the Holy Footprint, ring the bell once and see the awe-inspiring 'ira sevaya' or sun rise. There were six happy Catholics in the 'naday'. All of us simulated the walk of our Jesus Christ up to the summit of Mount Calvary. When we reached the summit we felt that both our celestial Teachers were there to welcome us. The Buddha spoke on the five noble precepts that are for all time. He said that man was his own decider of his destiny. He has to paddle his own canoe to the final destination, which could be determined only by his actions. Yes! He said "Do not do to others what you do not wish to be done to yourself". Years later, Jesus said "He that is without sin let him cast the first stone", when a woman in sin was brought before Him by the hypocritical Jewish elite. The Buddha-said "Thanahathi Jayathi Shoka" - sorrow is always behind greed. How true. This beautiful saying has also been mentioned by Jesus Christ when he said "It is easier for a camel to pass through the eye of a needle than for a rich man to enter the kingdom of Heaven". We have seen how prophetic and thought provoking words these sayings are when we go down memory lane. I believe in the existence God. He gave us a conscience, a free will to know right and wrong. He gave us celestial teachers to guide us towards Nirvana. Once, a very high ranking church dignitary said. (quote) "You know son, it is the fragrance of the Buddha's teachings that has made this country to be resplendent as a tolerant, compassionate Nation with smiling citizens." Even our foreign friends be they tourists or directors of many a multinational companies, foreign banking magnates and even diplomats have spoken about this our beloved Isle. We have been exposed to the sublime teachings of the Buddha that has made this land a veritable Garden of Eden. I am not competent to delve into the essence of the Buddha's teachings but we know that Jesus and He strived very much in their own way to heal the world. In our own little land, the Buddha's teachings, his precepts have made many a mortal to think and meditate. A Japanese delegation comprising academicians from twelve facilities was on a three month study tour to Sri Lanka. They had been stopped at Avissawella on the night of Vesak and much to their surprise served with lots of sweetmeats, soft drinks and coffee. Payments? No they had said this was in commemoration of the Birth, Enlightenment and Passing away of the Buddha. The visitors had been tears. They said "Has there been any monarchs in the world where they have bequeathed to their citizens water in the form of large water bodies for them to irrigate, bathe and drink. The water tanks set near Buddhist temples blend with nature. Where has a king decreed that all his subjects who pass the tomb of his opponent-slain in battle-should alight from their horses or chariots as a gesture of honour". They had all, stood bowed their heads and said "No where" "Nowhere" they had all shouted. "Only in your country." "This group had been told about the sad event that happened at Kalawewa". When this team visited the site, they had removed their headgear. They had taken water from Kalawewa. This water is more precious than the exquisite gems of your land. We will come for the star rubies and blue sapphires next time. Your kings have given you living civilisation - water. They did all this because they wanted to follow the teachings of the Buddha". Then they had said. "The Buddha has a soft corner for your people and your country"
What beautiful words from those of another country. Where else in the world are Christmas nativity cribs placed at junctions illuminated by a power source from a Buddhist home. At times from a Buddhist temple nearby. Here we see ice-cream and refreshments served by Buddhists, during church festivals. Ours is a country where Catholic youth join hands with their Buddhist counterparts in organising 'dansalas' during Vesak and Poson. 'Bhakthi Gee' is sung by the youth. The chariot starts from the church premises. Can one name any country where petite Biriyani packets are presented to those walking in a church precession? Even the blessed Prophet Mohammed must be in smiles in seeing the actions of His believers living in this country.